Thursday day dawned like all the others. I was very sleepy when I got up, and knew that doing devotions in my room or on my bed would most likely result in me falling back asleep, so I headed outside to the porch swing, armed with my Bible, devotional books and notebooks, and a jacket so I wouldn't freeze. The morning was absolutely beautiful, and being outside in God's creation helped me focus more on Him. It's nice to enjoy that cool part of the day before the sun makes everything scorching hot! My morning routine was much the same: shower, blueberries, breakfast, computer, family devotions, etc. I filled my little basket with blueberries - they're popping out all over the bushes now! I also practiced and did some piano theory in preparation for my lesson, and gathered together everything I'd need for the long day ahead. Thursdays are definitely my busiest days! 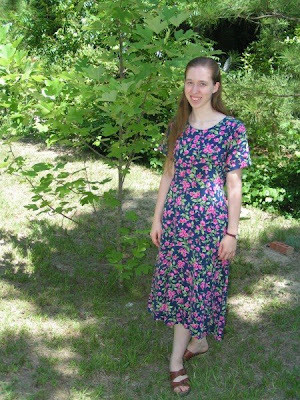 On this day I wore a light and very comfortable dress that mom found on sale at either Goody's or Belk. I like how "fluttery" it is. =) The one downside is that clothes these days don't seem to be made as high quality - I had to re-hem the skirt and sleeves because the tiny thread that had hemmed it just came right out! I left the house at 10:50 a.m., eating lunch on the go, and stopping to get gas and deposit checks at the bank on my way to piano lesson, which I have every-other week. Finishing at noon, I dropped by the post office and Walmart, then went to the church building where I teach. I teach 3 classes this summer, from 1:15 - 4 p.m. The classes have been smaller, with many people quite busy this summer, and most days quite a few girls are missing. However, I have fun with those that can make it, and we enjoy dancing together and learning new steps and techniques to praise God with dance! Aren't they cute? 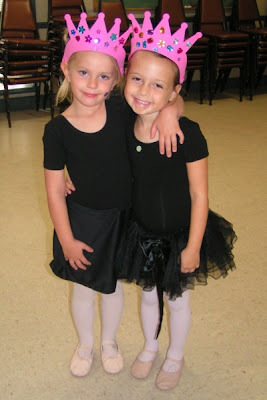 =) These are two of my 4-year-olds - the other girl in that class didn't make it that day. We had an activity of making crowns, talking about how we are princesses - daughters of the King of Kings. As my dance students left, Jubilee was dropped off at the church while mom and dad went shopping. She practiced and read, and I prepared for the evening's musical rehearsal, planning what we'd do, and looking through costumes. I ate my packed supper and read, and enjoyed playing "Fur Elise" on the beautiful piano. As Jubi and I cleared the stage, people began arriving for the rehearsal of "Fat Fat Jehoshaphat" from 6:30 - 8 p.m. The rehearsal went really well - everyone is doing great for it only being out second time to go through the musical! There are, of course, challanges, but I really enjoy working with everyone. Though I was quite tired after dance, once I started directing, I was energized and had a great time, all the while trying to keep track of what all 25 people were doing on stage. We have 2 dads playing parts, and it's been a great blessing to have them there to help give suggestions (they're both great actors and have done many dramatic productions). After cleaning up, we headed home, as the exhaustion began to hit me! Here I am one tired Anna! After checking my email, I headed for bed, feeling like I was going to drop. Daddy was very kind to massage the soreness out of my back, though as I finally lay in bed, I still felt pretty achy! After finishing World Magazine (these thicker issues take a lot longer to read all the way through!) I turned off the light at 10:17 p.m.
Hi! I read all of your posts about the week of "Feminine Dress" and discovered something... Your blog rocks! You're one busy girl. I think its neat that you can relate lessons to your ballet classes. Thank you ladies for posting your week in feminine dress. It's wonderful to know there are other young ladies out there that vow to dress modesty. You look beautiful! Keep up the excellent work. That's a pretty summer dress.Sounds good to have fresh blueberries each morning.Do you grow any other berries? I'm glad you all are enjoying this series! I sometimes feel that my days are pretty boring to read, but I hope you enjoy these glimpses into them for a week. Robert: No, we don't grow any other berries. However, we do have a Fig tree that does well, and an apple and pear tree that gives us maybe one fruit a year! =) Jubilee and my dad have planted a small garden this year as well, with tomatoes, green beans, etc.